Add a stylish touch that will complete your living space with this sleek hall console table finished in a warm cappuccino. The curved, half-moon shape is complimented by the chic tapered legs. Ample surface area and a two-tiered design make this piece perfect for displaying your favorite decorative items or pictures. Grab your guests' attention with this dark taupe reclaimed-look accent table. This sturdy 32" long accent table has symmetrical lines and a unique flair. Great for storage, displaying pictures, decorative pieces or books, this accent table is sure to be a great addition to your hallway, entryway,living room or office. Make a bold statement in your living room or hallway with this 48" long dark taupe accent table. Featuring a thick panel design, asymmetrical lines and an edgy modern appeal this table will surely make an eye catching addition to your living space. Perfect for displaying pictures, decorative pieces or books this accent table is the ideal combination of fashion and function. Be the talk of the town with this mirrored accent cabinet! This modern and edgy piece will no doubt be an eye catcher in your bedroom, hallway or living room. Its drawer and cabinet area with chic knobs, offers you space to store your clothes, blankets, keys or accessories. Its smooth top surface is perfect for adding pictures or decorative items. Add this to your room along with the rest of our mirrored collection. This bentwood accent table provides a convenient solution for placing snacks or drinks while sitting on a sofa. A circular cappuccino base and stand offer sturdy support, while a tempered glass top has plenty of space for putting a cup of tea, bag of popcorn, or bowl of ice cream. Its structure is also curved gently forward so you don't have to constantly get up or uncomfortably stretch to set your snacks aside. Functional and stylish, this piece is a must-have for any living room. Cappuccino 36"L Hall Console Accent Table Add a stylish touch that will complete your living space with this sleek hall console table finished in a warm cappuccino. The curved, half-moon shape is complimented by the chic tapered legs. Ample surface area and a two-tiered design make this piece perfect for displaying your favorite decorative items or pictures. 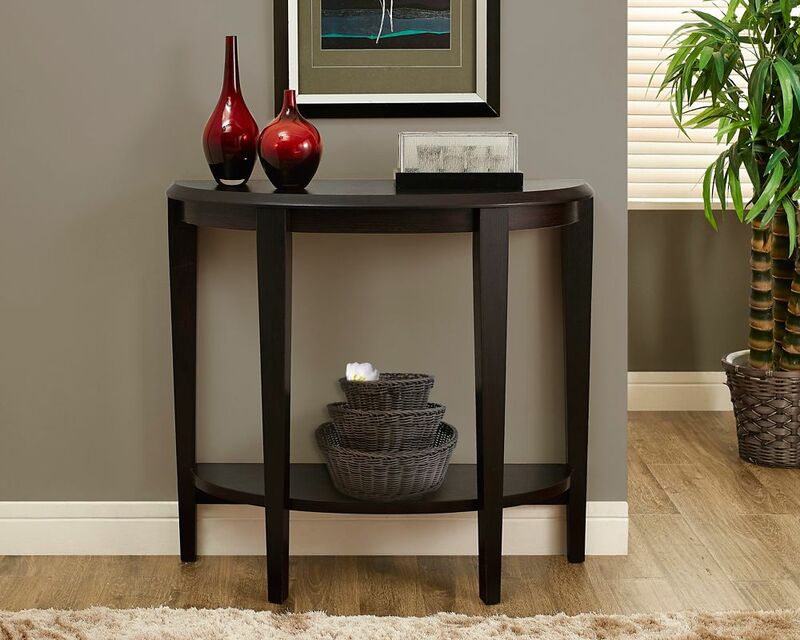 Cappuccino 36"L Hall Console Accent Table is rated 4.7 out of 5 by 18. Rated 5 out of 5 by Debra from The table was not difficult to assemble. It took less... The table was not difficult to assemble. It took less than an hour. I get so many compliments on the table. It adds just the right touch to my foyer. I love it! Can someone please tell me the accurate measurements of this table? &nbsp;I'm pretty sure the 'height' is not 12 inches. &nbsp;Thank you! Hello, the correct assembled dimensions for this hall console table is: 36&quot;W x 11.75&quot;Dx32.5&quot;H. Here is a lineart image showing all the dimensions if it helps: http://www.monarchspec.com/PRODUCT_PHOTOS/LINEART_DRAWING_2000x2000/I 2450.jpg. We apologize for the confusion. Thank you.